Forget about celebrity buzz, glamorous gowns or even red carpets. The Helsinki International Film Festival, down to its whimsical subtitle – Love & Anarchy - is a laid-back movie affair for people who are passionate about interesting stories. The 27th edition broke previous audience records with over 61,000 visitors. It was more than 2,000 movie lovers over last year’s mark. “This is an exceptional cultural event because it has grown every year. People are coming back and bringing a new audience with them,” said festival artistic director Pekka Lanerva in remarks at the Bio Rex, a movie theatre in downtown Helsinki which first opened in 1936. The festival capitalizes on Helsinki’s unique cultural position as a crossroads of East and West. “We belong to the Nordic countries, but at the same time we are part of Eastern Europe,” explained Lanerva. “Finns understand Eastern European films well. That’s why our festival has a diverse selection of Baltic and Russian movies. That is one thing that makes Love & Anarchy different from many other European film festivals. For Sara Norberg who has been the festival’s Executive Director for four years, the passion project has been the Haute Cuisine, Film & Dinner special screening series. For example, after seeing Jon Favreau’s Chef, movie goers continued the evening with a dinner at the Sunn restaurant, in the middle of Helsinki´s old city center. “We created different themes for people who are interested in other cultures. Asian, French and Spanish movies are especially popular. We also have been investing in internationalization. Three years ago we started the Finnish Film Affair, an event where Finnish films are showcased to international industry professionals. This year over 100 people around the world attended the three day event,” Norberg says. The Finnish Film Week featured local premiers and a selection of Finnish films and documentaries from the past year. Among those were Finland’s official submission both for the Academy Award and Golden Globe Best Foreign Language Film, Pirjo Honkasalo’s Concrete Night and also Finland’s second official entry for Golden Globe for Best Foreign Language Film, Dome Karukoski’s The Grump. Finns are known for being quiet in public events but they had plenty of questions for directors, screenwriters and producers who stayed after the screenings for the Q&A sessions. The 10-day festival was packed with screenings and events. One could bump into filmmakers on the streets of Helsinki or if you were an invited guest there were many opportunities to talk with Finnish and international filmmakers in private events. Like the opening party at the Le Bonk club, the cocktail reception at the Kafe Mockba (a Kaurismäki brothers’ back in the USSR style bar). The City of Helsinki’s reception at the Old Court House or the dinner at The Uunisaari restaurant which included sauna benches after the dinner. There was no need to be shy: There were separate saunas for men and women and one could use swimwear or towels instead of the au naturel style favored by Finns. And let’s not forget about American movies. Even if Love & Anarchy is focused more on Nordic, European, Russian and Asian movies, the festival’s opening and closing night films were both American. It opened with Damien Chazelle’s Whiplash and when Miles Teller drummed his heart out the audience applauded ecstatically. The festival ended with Richard Linklater’s Boyhood and a Q&A with its star, Ellar Coltrane. 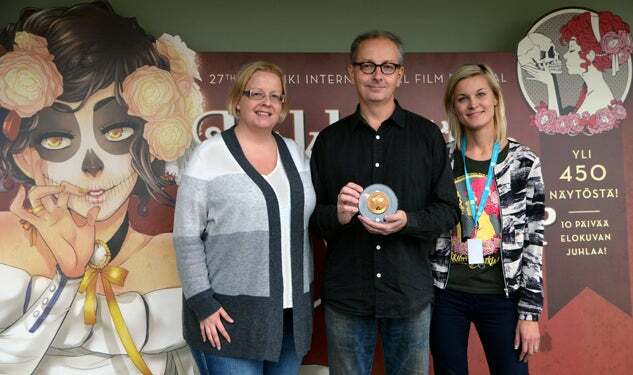 In the end Hollywood Foreign Press Association recognized Helsinki International Film Festival – Love & Anarchy and presented our organization’s plaque to Pekka Lanerva and Sara Norberg.